A quirky comedy about love of all sorts that blooms when a colorful group of characters is snowed in for the night at a diner in the Midwest. 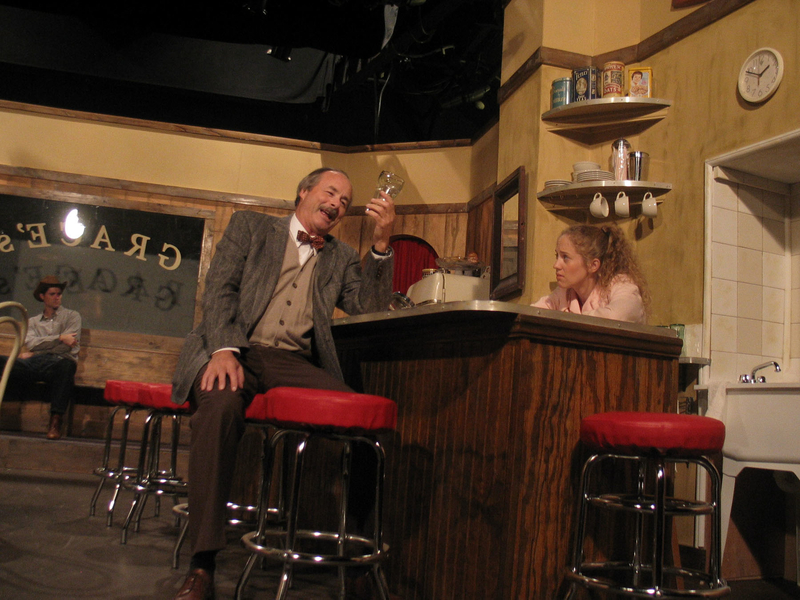 ANDREW BOTSFORD (Dr. Lyman) is a veteran of more than 30 Hampton Theatre Company productions since 1985. 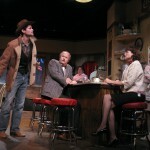 He appeared last season as Dave Moss in GLENGARRY GLEN ROSS and Richard in MOON OVER BUFFALO. Favorite shows include EVERYTHING IN THE GARDEN, THE FOREIGNER, ORPHANS, NOISES OFF, THE DINING ROOM, SYLVIA, SOCIAL SECURITY, RUMORS and GLENGARRY. Andrew is a member of the Hampton Theatre Company board of directors and the associate editor of The Press Newspaper Group, which publishes The Southampton Press Eastern and Western editions, The East Hampton Press, and The Press of Manorville and The Moriches. SANDRA CUMMINGS (Cherie) is a NYC based actor who is delighted to be doing her first show with the HTC. Some recent credits include Babe in CRIMES OF THE HEART at T. Schreiber Studio, Portia in JULIUS CAESAR with Shakespeare In The Wild, as well as numerous new plays with the Aching Dog Theatre Co. She has a long thank you list: the cast, crew, the director, George Loizides, her brother Steve, as well as all of her friends and family that made it out to show their support. Love and special thanks to Frank and his mom, Linda. Sandra dedicates this performance to her mother. JAMES EWING (Virgil) founded the Hampton Theatre Company in 1984 and has since appeared in over 20 productions and built numerous sets. 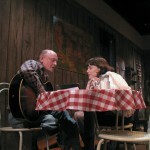 Favorite roles include Colonel J.C. Kinkaid in last season’s production of THE OLDEST LIVING GRADUATE, Owen Musser in THE FOREIGNER, Artie Shaughnessy in THE HO– USE OF BLUE LEAVES, Nonno in THE NIGHT OF THE IGUANA, Tobias in A DELICATE BALANCE and all the many characters of THE DINING ROOM. He is happy to be returning to the stage in this lovely play and would like to welcome director George Loizides to the team. MATTHEW O’CONNOR (Will) made his acting debut last spring as Clarence Sickinger in HTC’s production of THE OLDEST LIVING GRADUATE. This past summer he appeared in COMEDY OF ERRORS with Northeast Stage and studied acting with Alec Baldwin and Michael Disher. Matthew is from the Bronx, New York and has lived in Hampton Bays for 8 years. He works for the Southampton Town Police as a Public Safety Dispatcher and, in his spare time, plays bass guitar with his cover band StoneHouse. BILLY PATERSON (Carl) has been an actor for more than 25 years and has been on stage in Los Angeles, New York City and most of the East End theaters. Billy last appeared with the HTC as Baylen in GLENGARRY GLEN ROSS and is happy to be back with this very professional and distinguished company. PETER STEWART (Bo) returns to the HTC stage after playing Mike Tremaine in THE OLDEST LIVING GRADUATE and Paul in MOON OVER BUFFALO. He is happy to be working with such a talented group of people. He would like to thank everyone involved for their hard work and dedication. KATIE TAME (Elma) is thrilled to be working with the Hampton Theatre Company. Originally from Maine, and a graduate of Hampshire College, she now resides in New Jersey. Katie has worked with Tri-State Actors Theater in: THE GLASS MENAGERIE (Laura), A STREETCAR NAMED DESIRE (Stella), TWELFTH NIGHT (Olivia) and A CHRISTMAS CAROL. With Centenary Stage Company she played Agnes in THE SCHOOL FOR WIVES. Other favorite productions include THE ILLUSION, RHINOCEROS and HAMLET. Katie participated in the International Emmy World Television Festival in NYC where she was directed by John Wooten in Felicity Carpenter’s award winning script: “Touching People.” Other NY credits include numerous showcases at Gotham Comedy Club and Theater 22 as well as the world premiere of MYTH at Columbia University. Television credits include Fuse TV and The History Channel. Currently she can be seen on Howcast.com in various comedic “how-to” videos. MARY-ALYCE VIENNEAU (Grace) appeared last season as Sister Aloysius Beauvier in the HTC’s fall production of DOUBT and as Claudine Hampton in THE OLDEST LIVING GRADUATE. A graduate of The American Academy of Dramatic Arts, she struggled with an acting career in NY for 13 years and then decided to pursue her other love—gardening. She has been running her business—Mary’s Garden—on the East End for 20 years but has found plenty of time to continue honing her acting skills with most of the companies out here. Mary’s additional HTC appearances include THE PRICE, THE HEIRESS, THE RAINMAKER, STEEL MAGNOLIAS, A VIEW FROM THE BRIDGE, ABSURD PERSON SINGULAR and SOCIAL SECURITY. GEORGE A. LOIZIDES (Director) a new member of the Hampton Theatre Company board of directors, appeared with the company for the first time as George Aaronow in last winter’s production of GLENGARRY GLEN ROSS and makes his directorial debut here with this production. George has been an actor and director for almost 40 years. For 27 years, he was Director of Theatre Arts for Ward Melville High School where he directed 81 productions. 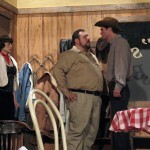 Other recent acting credits include Axel in THE NERD, the Stage Manager in OUR TOWN and Dr. Lyman in BUS STOP. In 2006 he directed PRIVATE LIVES for Playcrafters of Bellport. Thanks to his muse, Kathy, for everything. JOHN ZALESKI (Stage Manager) is delighted to have been asked to join the Board of Directors of the Hampton Theatre Company, where one of his duties will be to bring the guns to the meetings. 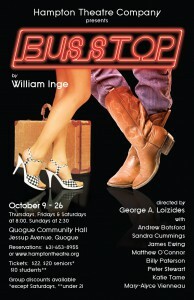 He would like to thank the cast and crew of BUS STOP and its director, George Loizides. (Go to lunch, George!) This is John’s 99th production. DIANA MARBURY (Set Decor, Producer) is excited to begin the 24th season with this delightful classic by Inge. She would like to thank all the participants in our benefit this August. She would like to give special thanks to Lulie Morrisey for her outstanding organization of the event. Also, thanks to Ann Marie Carr for hosting and sponsoring our past benefits. Such generosity enables the company to provide the quality of theater that the HTC strives to bring to our community. Diana has had the privilege to witness the tremendous growth of this company over these years, and looks forward to the celebration of it’s 25th anniversary next year. Of course, first we will enjoy this wonderful and busy season! So, please, sit back and enjoy the show! SARAH HUNNEWELL (Producer) wears many hats for the HTC under the all-purpose umbrella of Executive Director. As the company grows bigger and better as we approach our 25th anniversary, she would like to welcome our new Board members to the company, Teresa Lebrun, John Zaleski, Bob Kaplan and the director of BUS STOP, George Loizides. We are very happy to add their creative energies to our band. She would also like to thank Lulie Morrisey, Joanna McDermott, Sue Clarke and the rest of Lulie’s committee for our spectacular benefit this summer and to thank Ann Marie Carr for all her support. 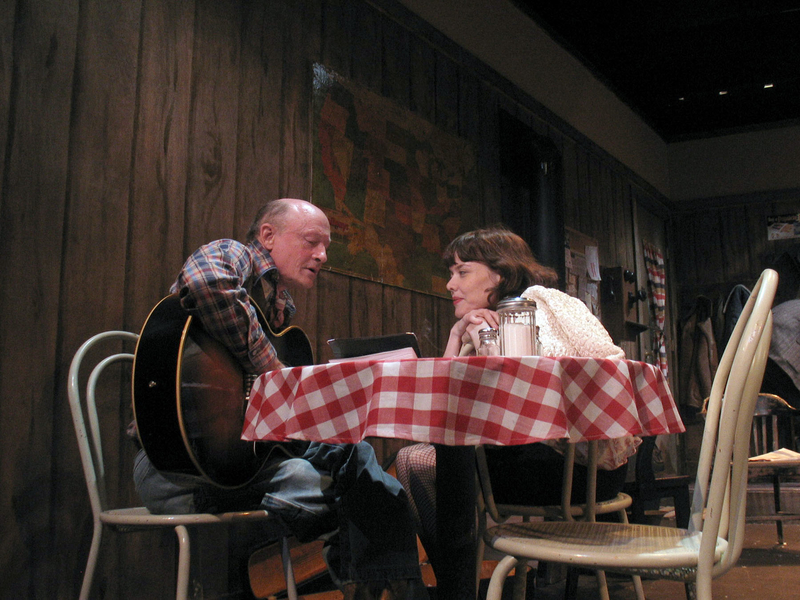 Long before Grace’s in Manorville served as a gateway to the East End off the Long Island Expressway, there was another diner by the same name on a snow-swept prairie in Kansas—the “Bus Stop” of William Inge’s 1955 play. 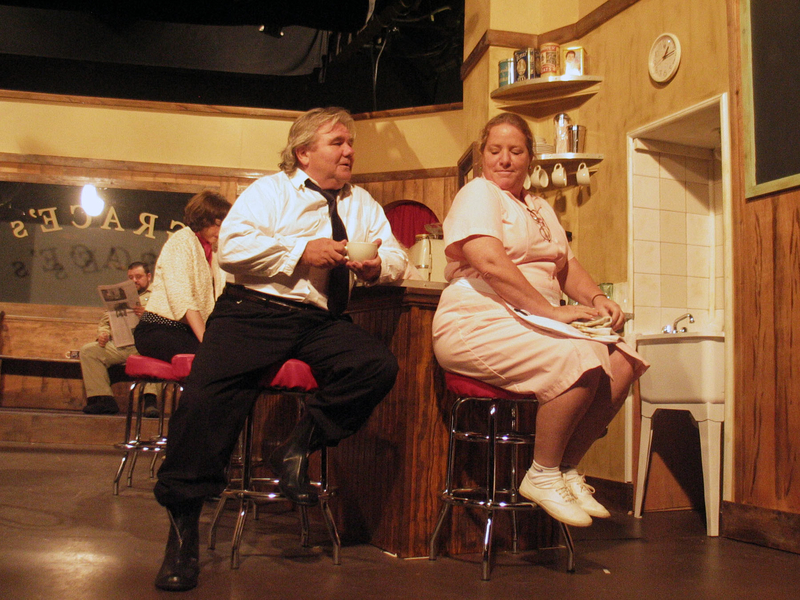 The Kansas diner is the setting for the Hampton Theatre Company’s highly enjoyable presentation of the play, directed by George Loizides, which opened last week at the Quogue Community Hall. It is well worth the journey to Jessup Avenue to meet the stranded travelers, their bus driver, and their local hosts as they share hot coffee and ruminations about the nature of life and love while waiting for snowplows to clear the road to Topeka. Grace’s diner, about 30 miles west of Kansas City, is both bus stop and haven. The audience is immediately comfortable, drawn in by the wonderfully evocative set (designed by Peter Marbury) with its pot-bellied stove, gingham tablecloths, authentic Coca-Cola sign, lunch counter, and chrome barstools covered in red—can it actually be pre-vinyl “naugahide”? A blackboard lists the menu; a wall clock is set to the time the action begins, 1 a.m.
Grace Hoyland, the earthy, no-nonsense proprietress, played by Mary-Alyce Vienneau, and her niece and waitress, Elma Duckworth, played by Equity actor Katie Tame, welcome the mismatched quartet of passengers the storm blows in. Will Masters, the local sheriff (Matthew O’Connor) is on hand as well, having stopped by to report on road conditions and check if folks are safe. Three of the four travelers already know each other. 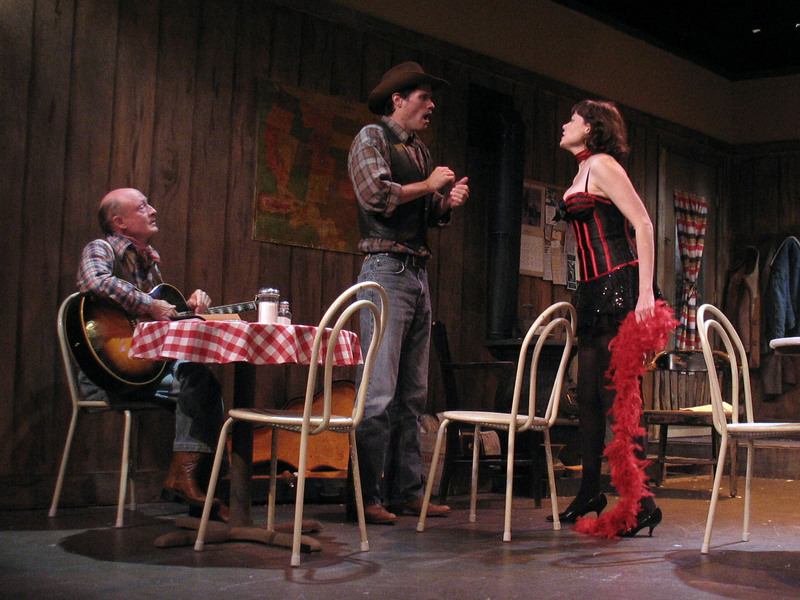 Cherie, played by another Equity actor, Sandra Cummings, freezing in a flimsy dress and fishnet stockings, is a nightclub “chanteuse” who claims she is being abducted by the rodeo cowboy, Bo Decker, played by the tall, lanky Peter Stewart. 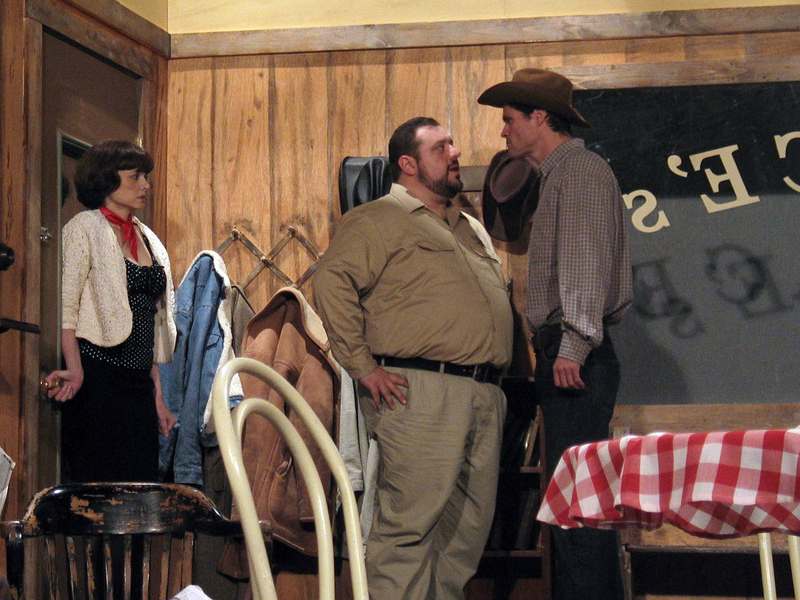 Bo is accompanied by his older ranch hand and mentor, the appropriately named Virgil Blessing (James Ewing). The well-dressed fourth is a stranger in every way. He enters quoting Shakespeare in a ringing, cultured voice, and scandalizes young Elma by demanding a double shot of rye. No alcoholic beverages are served at Grace’s, he is informed, so he pours his own from a pocket flask. This is out-of-work college professor Dr. Gerald Lyman, Ph.D., played by Andrew Botsford. Thrown into enforced comradeship by the storm, the travelers must now play out their personal dramas in a more public setting. 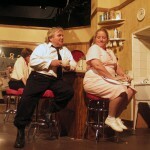 The storm raging at the center of Grace’s diner is the conflict between Cherie and Bo. The young woman protests tearfully that she is being carried off against her will, and cries out for protection. Bo, the belligerent cowboy, proclaims the opposite: he loves her; they are going to be married and live on his ranch in Montana. 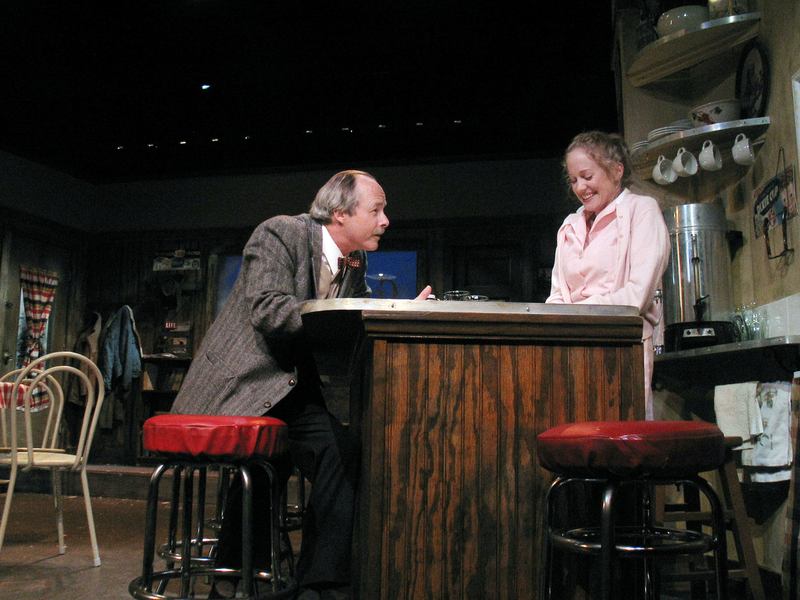 While new relationships develop—such as a dubious proposition by the professor to the awestruck Elma—an incipient affair ignites: the bus driver Carl, played by Billy Paterson, and Grace are sweet on each other. 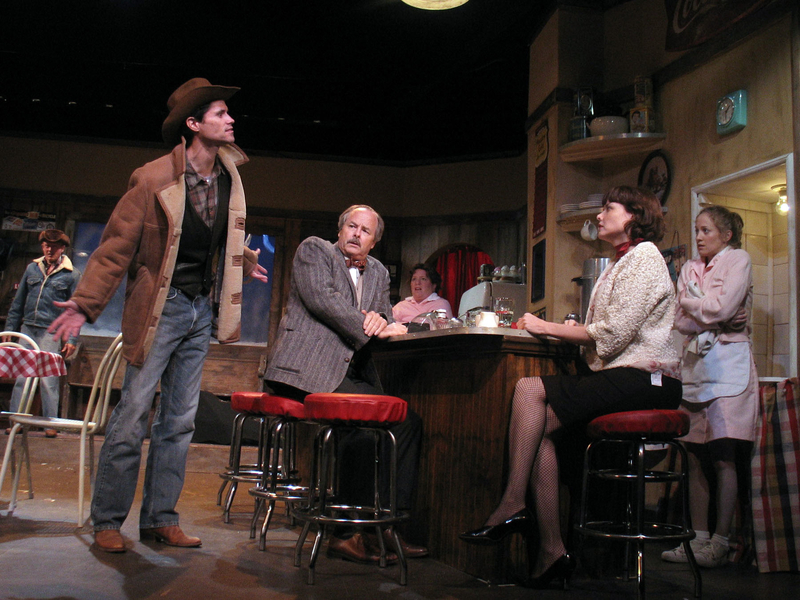 Because most of the characters remain on stage throughout the play, the audience can follow all the stories at once, as one or another is highlighted and characters reveal aspects of their past. To pass time and relieve tension, Elma proposes a “floor show” in Act II. This ingenious interlude gives the main characters—except Bo, who is sulking—a chance to entertain the others, and exposes yet more of their emotions. Asked to get things started, Virgil, who has sat quietly apart, keeping the volatile Bo out of trouble, sings and plays his guitar. The versatile Mr. Ewing, an HTC founder and frequent performer, serves up a modest number that serves as a backdrop for another of Bo’s attempts to win over Cherie. 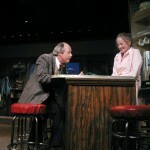 Although Mr. Ewing’s role is that of a self-effacing supporting figure, he develops his character to the point that his exit at the play’s conclusion offers one of the most touching moments in the entire show. On his knees below the “balcony,” Dr. Lyman, who has been sipping rye so steadily that he is no longer steady on his feet, intones Romeo’s pleas. Unlike Elma, he understands—only too well—what the tragedy is about. Mr. Botsford plays the complex character with subtlety as well as charm. In his performance, the professor is not just a drunken lecher, nor a pathetic mess, but a troubled soul who suffers because he has never known how to love. Finally it is the turn of Cherie, the abducted bride-to-be, who had packed her nightclub costume in her suitcase when she thought she might get away from Bo back in Kansas City. Ms. Cummings, a slender, pretty brunette, now makes the so-far plaintive Cherie come to life. Flourishing a red feather boa, she performs “That Old Black Magic,” by her account “one of my best numbers.” Ms. Cummings transforms Cherie into a splendid mix of humor and pathos, bravado and vulnerability. Wild applause on stage is led by the adoring Bo. And at last Friday’s performance, the theater audience joined in. Life lessons are learned during this snowy night, notably by Bo, the cocky cowboy. Mr. Stewart, who has appeared in several HTC productions, is convincing throughout, as his character changes from that of an obnoxious child who grabs at a sweet and flies into a tantrum when he is refused, to a shy young man deserving of love. His interactions with Mr. Ewing, Ms. Cummings, and indeed, all his fellow actors, are smoothly carried out. This production of “Bus Stop” once again showcases the high professional standards and extraordinary accomplishments of the HTC. Under the excellent direction of Mr. Loizides, both leads and supporting roles shine. Bravos all around, with special mention for Ms. Vienneau as Grace, the warm-hearted realist; Mr. Paterson as Carl, the sweet-natured bus driver; and Mr. O’Connor as the solid sheriff. Bravos are also due to the tireless and consistently excellent lighting designer, Sebastian Paczynski, and lighting and sound technician Rob Dowling (with particular thanks for the cowboy tunes). Teresa Lebrun’s costumes are nostalgically appropriate to the 1950s, and more applause for producer Diana Marbury, who also did the set décor; and producer Sarah Hunnewell.